Does lucymay belong in this group? 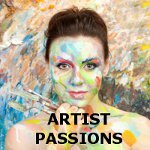 Let's inspire each other Visual artist and animator looking for friends. Does dyllonc belong in this group? Seller on Etsy Just looking for people to chat art with. Does lamb13 belong in this group? ATTACTIVE AND CEATIVE I love to go to flea markets where my imagination kicks in!! Someone else's junk becomes a pretty cool piece for me after I change a few things lol.. My hobby is making picture I collect the frames too there really isn't a spot on my wall that s empty!!! I am into music big time and can still cut a rug! Does bellasusanna belong in this group? Photography Been a professional portrait and fine arts photographer for about 4 years. Absolutely love it. It is a way to be able to artistically express myself with the every day things around us. Does blueybells belong in this group?